A number of Sikh organizations based in Belgium and other countries pledged their support to the upcoming protest on Indian Prime Minister Narendra Modi’s visit to Brussels on 31st March. 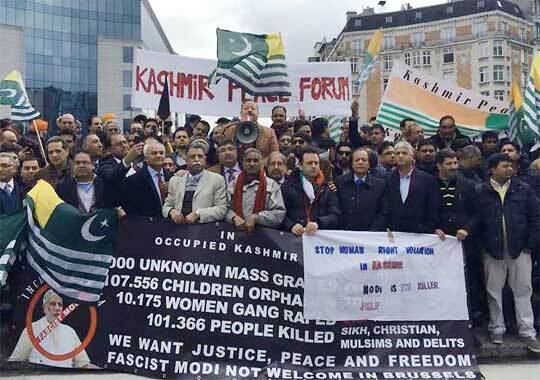 Kashmir Council EU which is main organizer of the forthcoming protest program including a demonstration and a one-day camp at the European Union Head Quarters Brussels, has launched a broad campaign for securing public support in this protest. So far, a number of the individuals and representatives of the different organizations have been contacted by the Kashmir Council EU Chairman Ali Raza Syed and other office bearers in the context. Europe based Sikh Organizations which declared their support to the protest are included Baber Khalsa, Dalkhalsa and All Gurdawara Committees Belgium, Dalkhalsa Switzerland, Dalkhalsa Germany, Sikh Student Federation Germany, Rasham Singh Baber Khalsa Germany and S.A.D. Maan Germany. Ali Raza Syed assured the Sikh community’s leaders that atrocities against the Sikh minority by the Indian regime would also be highlighted in the protest. The protest would be held at Place Schuman (near Metro Stop Schuman) in front of EU Council and Commission Offices where Modi’s meetings are supposed to be held in the capital city on 31st March (Thursday). Modi will visit Brussels for the first India-European Union (EU) bilateral summit in four years. According to a Press Release issued in Brussels, the protest would be started at 12:30 p.m.
Chairman Kashmir Council EU Ali Raza Syed who is also leading the council team for organizing the protest, said, we have received very positive response of different circles so far and I hope that a large number of Kashmiris and representatives of minorities and other oppressed people of India would attend the upcoming gathering in Brussels. Kashmir Council EU has already requested the leadership of both side of Azad Kashmir and Indian Held Kashmir and members of the all minorities and other suppressed people in India to attend the protest. The PR said, the protest is against Modi’s fascism particularly Indian brutalities against the people of occupied Kashmir and exploitation of Kashmiri students studying at different Indian Universities and as well fascist and exploitative policies of Modi’s government against various minorities including Sikh community and other segments of the society in India. Many other issues related the rights of people in the different Indian parts would also be raised during the protest.